The Nokia 8 Pro is expected to hit the market in August-September with a Qualcomm Snapdragon 845 onboard. Obviously, nothing has been confirmed by HMD Global yet. 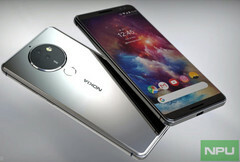 Those expecting for a Nokia 10 top-of-the-line flagship might be a bit disappointed if the latest rumors turn out to be true, because these rumors claim that a Qualcomm Snapdragon 845 handset known as Nokia 8 Pro will hit the market later this year instead. We recently heard of an upcoming premium Nokia flagship that might hit the market as Nokia 8 Sirocco. However, that name was spotted in a recent APK teardown and certification, so it is no surprise that HMD Global has not confirmed its existence yet. On the other hand, the Nokia 10 renders that surfaced online recently next to a few details might be, in fact, related to the upcoming Nokia 8 Pro. Anonymous sources familiar with the matter who talked to Nokiapoweruser claim that the Nokia 8 Pro is in the works and its launch is scheduled for August-September. The same source also revealed that the Nokia 10 is not in the works yet. At last, the only Nokia 8 Pro-related details to mention right now are the Qualcomm Snapdragon 845 processor and the advanced camera hardware and software that are rumored to be included as well. To be more specific, we can guess an advanced dual camera setup or even a tri-camera one, next to a smart AI-driven software solution. Some tips also suggested a Penta-lens camera module with rotating Zoom technology by Zeiss. We will let you know as soon as we find out more, so stay tuned.